Silver Creek is the name given to the meandering water feature that begins in Disney’s Wilderness Lodge’s lobby and ends down along the shores of Bay Lake. Along the path Silver Creek takes the form of a hot spring, which can be viewed in the lobby, a quiet stream where guests can relax, a cascade of whitewater known as Silver Creek Falls, a swimming area referred to as Silver Creek Springs, and, finally, Fire Rock Geyser. 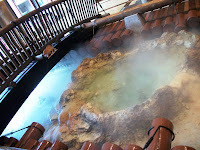 Obviously, the water that bubbles in the lobby’s hot spring is not the same water that guests swim in downstream in Silver Creek Springs. The effect is reached by segmenting Silver Creek into sections that can be separately control for the amount of water and the speed at which it travels. The majority of these sections are created by the most obvious, and often overlooked, partition: the bridges that crisscross the waterway. Beneath these bridges water spills down to be reclaimed and new water begins the next leg of Silver Creek’s ambling. After passing over waterfalls and through the Silver Creek Springs pool area Silver Creek finally finds its way to the rich pools and vivid rocks of Fire Rock Geyser. 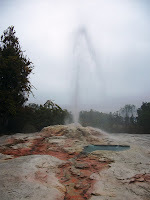 While the geyser may not have quite the same head of steam as the timely spouter it is modeled after, Old Faithful, Fire Rock Geyser does have a terrific Imagineered backstory. According to the legend, Native American hunting parties used the warm waters near the hot springs for fishing and heat during frigid winter treks. During a particularly vicious journey, the hunting party was forced to not only set up camp for several days, but also to keep their fire burning continuously, a situation they considered to be very wasteful. Five days on, the ground began to rumble and fissures were created. On the sixth day, the crevices became larger, and the trembling became more volatile. Believing that they had enraged the Earth, the hunting party met to discuss the idea of beginning the treacherous voyage home or stay in the camp. Resolved to stay, another log was added to the fire. Suddenly, the trembling became a violent shudder. As the group fled from their teepee, the cracks burst open with a great spout of water. By the time the column of water subsided, the fire had been extinguished, the teepee had been destroyed, and the hunting party was no where to be found. So was born Fire Rock Geyser. What a fantastic article! 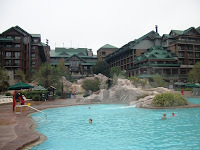 Wilderness Lodge is one of my favourite resorts, although I feel I don't know enough about it. This is great! 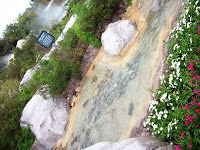 And I love the Imagineering behind Fire Rocks Geyser - I adore those Imagineers! Excellent article, Ryan! I'd always assumed that the water that started in the lobby wasn't the same throughout the entire creek, but I never thought to look under the bridges! Awesome article. I love reading things like this about the hotels. And this is one that I really want to see the next time i'm there.